A mysterious disease is killing poultry by the thousands in the district of Baramulla (India). A large number of poultry died on a single poultry farm in the Amargarh area past Sunday. Local authorities suspect Ranikhet Disease (RKD) to be the cause of death, but do not rule out the possibility of other diseases being responsible. The Greater Kashmir reports that a team of officials has been dispatched to Amargarh Sopore to ascertain the cause of death. "Symptoms suggest that the disease may be Ranikhet," Dr Muhammad Shafi, Chief Animal Husbandry Officer Baramulla, said. Reports of sudden deaths among poultry are coming from different parts of the district. "I lost 214 birds in a single day on Saturday. I don't know the cause of death, there is panic among local poultry producers," Wajid Ahmad of Pattan Baramull said. 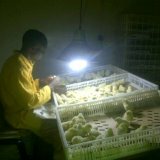 The poultry business in the district has grown phenomenally in recent years: according to official data, around 30,000 people in the district are working in the poultry industry. There are around 510 poultry farms registered with the department while around 150 unregistered farms are also operating in the district. Ranikhet disease is the commonly used name in India to mean Newcastle disease. In poultry there is no such mysterious disease that can't be diagnosed. This must be either Virulent ND or else similar HPAI. A mysterious disease is killing poultry by the thousands in the district of Baramulla (India). What is this mysterious disease??!!. Where are the so called experts have gone??. Don't even diagnize??. This must be either Virulent ND or else similar HPAI, as Dr. Rao has told. I think it needs a rule of looking deep into the causes.